The uncontested leaders in digital advertising, Google and Facebook, have both recently announced that tracking customer’s actions offline will be easier than ever. First of all, Google is giving more and more retailers access to store visits tracking within AdWords as well as integrating the platform directly with Salesforce. Facebook, on the other hand, is bolstering its online-to-offline measurement solution by partnering with IBM, Index and Square to link Facebook Ads with point-of-sale systems. Let’s explore how these new features will change the way you manage and optimize your online campaigns. Google launched store visits conversions in AdWords back in December 2014 but seems to only have been rolling it out in a significant manner (at least outside of the US) in the last few months. It tracks users who have opted in to having their location history shared as well as extrapolates for signed out users based on their behaviour. While obviously not the most accurate way to track each and every users’ conversion path, this data can be very useful to retailers. For example, weekly and monthly trends, as well as differences in foot traffic from one location to another, can inform us on when and where the marketing budget would be best spent. When it comes to lead generation campaigns, one common complaint among digital marketers is our lack of visibility once leads have been sent to the client’s sales team. 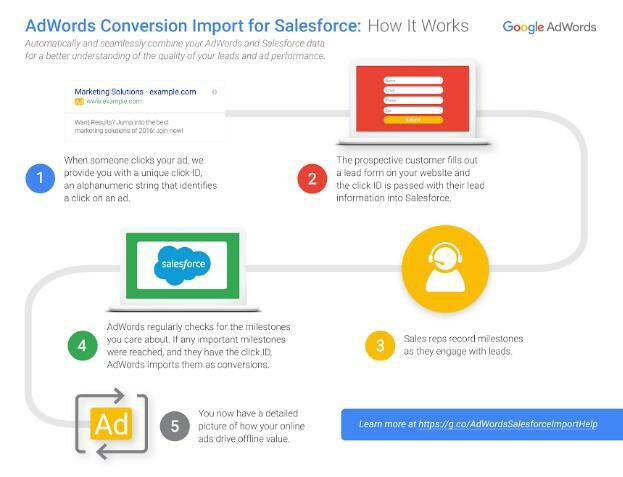 Even if we know whether or not the sale was closed, that data isn’t easy to associate back to a specific campaign/ad group/keyword… AdWords and Salesforce have partnered to try and solve this problem by sending back a lead’s status to AdWords as a conversion event. With this integration, we can go even further and associate the average value of a lead to the conversion event, which then enables digital marketers to report on the return on ad spend of their lead generation campaigns. Last but certainly not least, Facebook very recently introduced integrations with point-of-sales systems, notably Square. Such a tool not only enables marketers to bridge online efforts and offline sales but also gain valuable information on in-store buyers. Having real-time demographic data on offline buyers can greatly help us build more effective and relevant campaigns, especially given Facebook’s depth when it comes to audience-based targeting. And this is just the beginning. I believe we have only seen the beginning of offline tracking. While the adoption of beacons is not yet mainstream, they could enable us to track offline action more accurately as well as customize advertising campaigns based on very precise location data.